On June 6th, 1944, allied forces crossed the English Channel, stormed the beaches of Normandy, and began pushing the Germans back towards Berlin. The long planned and eagerly anticipated D-Day invasion was the beginning of the end of the Nazi nightmare that had gripped Europe since September of 1939. However, at that moment, no one knew exactly when the war would be over. No one knew it was going take 11 more months of worldwide death, destruction, and heartache before Germany finally surrendered and another two months after that before Japan capitulated. The year of the invasion, Evelyn Cole was studying Physical Therapy at NYU. Her younger brother, Oscar (below left), was a seaman in the U.S. Navy. Her older brother, Lawrence (below right with Evelyn), was a Tech Sergeant in the US Army Air Corps. Ella, the youngest, was still in high school. Not yet old enough to enlist, Ella did her bit for the war effort by dating sailors from the nearby naval base. She ended up marrying one. As the summer of ’44 began, Evelyn didn’t see any reason why her brothers should be the only Coles serving their country. So, she enlisted. 1933 – Top to Bottom. 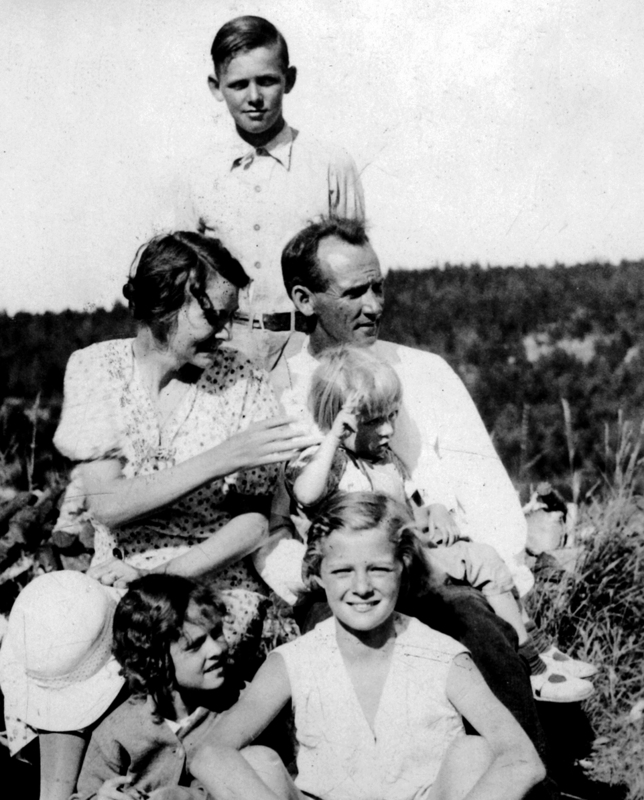 Lawrence, Doris & Guy Cole (The child in Guy’s lap is a relative, Pat Whitmore) Ella and Evelyn. The picture was taken in the yard at the family home in Winter Harbor, Maine. The Cole children had grown up in Winter Harbor, Maine, a small coastal fishing village near Bar Harbor. Their parents, Guy and Doris, were no nonsense, salt-of-the-earth, self reliant, down easterners. Guy was a lobster fisherman who, every day, took his boat out, alone, hauling traps and retrieving lobsters to be served in fancy restaurants up and down America’s eastern seaboard. Doris took care of the household, nurtured the children, and cooked on a black, cast iron, four burner wood stove she used well into the 1960s. My strongest memory of my grandmother’s kitchen is the complex and pervasive aroma of fresh lobster stew, baked goods, and molasses. In the house my mother grew up in, the family bathtub was built in to a wooden bench in the kitchen. You lifted the bench seat and filled the tub with water heated on the wood stove. Then you bathed… in the kitchen. 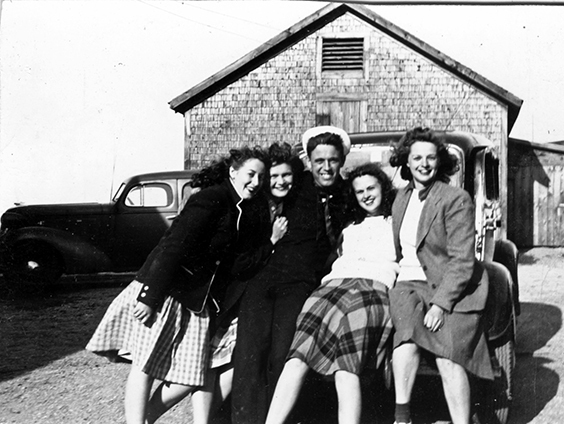 June 1944 – Winter Harbor, Maine L-R, Bea Rand, Jeanie Conley, a sailor named Mac, Ella and Evelyn Cole. Ella was dating Mac. Mac is not the sailor Ella married. Lawrence was a year older than his sister but somehow, they both graduated high school in 1939. Lawrence immediately joined the Army. By 1944, the Air Corps had made sure Lawrence was well traveled. He had already served in Panama and the Galapagos Islands and that summer he was based at Chakulia Air Field in Chakulia, India. American B-29s were flying from Chakulia, over the Himalayas, to forward air strips in China. There they would refuel and go on to bomb targets in Japan. Because of the lack of facilities at the forward air strips, B-29s flying “the Hump” from India to China would regularly take members of their ground crew with them to help service the planes when they landed to refuel. On July 26, 1944, Tech Sgt. Cole and another member of the ground team joined the 11-man combat crew of a bomber headed for the forward base at Hsinching, China. Growing up, I knew the ultimate outcome of this mission but the Cole family didn’t have much in the way of details. The following narrative was pieced together from documents I found on fold3.com, ancestry.com, and newspapers.com. Fair warning: It’s not a happy story. Take off was at 7:35 that morning. There were low clouds over the area but the winds were slight and the temperature was balmy 79°F. Just minutes after leaving Chakulia Field, as the B-29 reached 1000 feet, 22-year-old Irvin Gaver, the flight engineer alerted his pilot, 23-year-old, Captain Alvin Hills, that their #2 engine was running hot. Gaver recommended discontinuing their climb until the temperature returned to normal. Ten minutes after leveling off, Hills’ co-pilot, 1st Lt. William Houston, also 23, looked out his side window and discovered a much bigger problem… The #3 engine was on fire. Captain Hills immediately feathered #3 and ordered the flight engineer to cut the fuel to that engine and activate the fire extinguishing system. None of those actions helped. The #3 engine continued to burn. 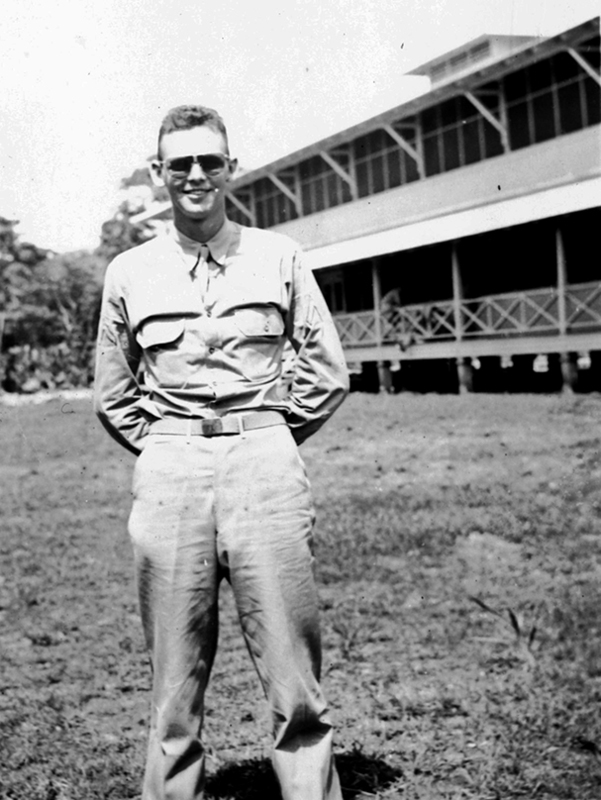 Hills then asked his navigator, 2nd Lt. Wilbur Wortman, for the nearest airfield. The 22-year-old gave his pilot a heading and Hills began a slow left hand turn that would take them to the landing strip at Kharagpur. Ten degrees into the turn, the over-heated #2 engine quit. In a four-engine bomber, with two engines gone and only 1000 feet of altitude, things go to hell in a hurry. Captain Hills immediately ordered his bombardier, 2nd Lt. Roger DiLollo to jettison their bomb load and the extra fuel tank they had to carry in the forward bomb bay to get over the Himalayas. He told his co-pilot to alert the crew to prepare for an emergency landing. It was right about this moment that engines #1 and #4 stopped working. The B-29 Superfortress was now, essentially, a big heavy glider. To prevent a stall, the pilot pointed the nose of the plane earthward. In less than a minute, the bomber broke through the clouds 100 feet above the ground. Captain Hills had only seconds to line up on the rice paddies that appeared in front of him as he came out of the overcast. Just before impact, Hills ordered flight engineer Gaver to cut the electrical switches to the engines. The crash landing went pretty well as far as crash landings go. The bomber remained largely intact as it plowed through 1600 feet of local rice crop and came to rest against an embankment. But that was a good as things got. The crash ruptured the wing tanks. Now large quantities of aviation fuel were spilling out of the plane and the #3 engine was still on fire. Almost as soon as it stop moving, the B-29 was engulfed in flames . Miraculously, the tail gunner, 23-year-old Sergeant Roy Teter, exited his position in the tail completely unharmed. He and Sergeant Samuel Polonsky, who had gotten out with only minor injures, teamed up to pull the left waist gunner, Tech Sergeant George Birkinsha, out of the right waist gun position. Once free, the two men dragged the badly burned Sergeant away from the plane. There they were joined by the oldest member of the crew, 40-year-old Sergeant James Harmen who had gotten himself out of the left side of the bomber. He too was badly burned. No one else made it out of the back of the B-29. 34-year-old George Birkinsha would die of his injuries the next day. Up front, Captain Hills scrambled through the window exit beside the pilot’s seat then turned and dragged his co-pilot out of the flaming cockpit. They both suffered burns. Houston would not survive. The bombardier, Roger DiLollo made it out of his position in the nose of the plane on his own but was also burned. Five days after the crash, the 22-year-old 2nd Lieutenant would succumb to his injuries. The entire flight lasted 20 minutes. Only five of the original thirteen crew members survived. 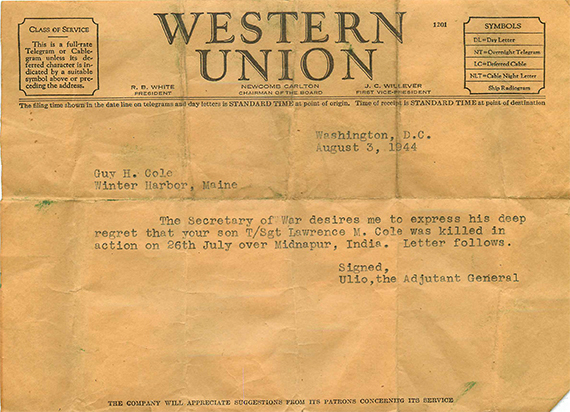 Evelyn’s brother, 23-year-old Tech Sergeant Lawrence Cole, and seven of his comrades died in India somewhere near the city of Midnapur, nine miles short of the runway at Kharagpur, and a long way from home. I researched the members of the crew Lawrence flew with in India because I wanted to know more about who they were and, given the sacrifice they and their families made, remembering their names is the least we can do. The other crew members who perished with uncle Lawrence were: Sergeant Theodore R. Smith (25) from Montrose, Pennsylvania, Sergeant Jessie R. Pierce (30) from Auburn, California, and the youngest member of the crew, 21-year-old Sergeant James J. Dignan from Cincinnati. The Secretary of War had eight telegrams to send. This is one of them. August 8, 1944 – How Guy and Doris Cole got the news. As the Cole family grieved the loss of their son, they were not alone. Numbers vary but between 300,000 and 400,000 American military personnel died during WWII. That’s an average of between 200 and 300 deaths a day… every day… for three and a half years. In cities and towns all over America, the bad news arrived daily by telegram and north, south, east, or west… Black or white… Christian, atheist, or Jew, Democrat or Republican, whether you had someone serving overseas or not… Everyone came to dread seeing the Western Union guy coming down their street. Ten months after the crash in India, on May 29, 1945, Sergeant Polonsky, who helped Roy Teter pull Birkinsha out of their burning bomber, flew another B-29 mission out of an airfield on Tinian Island in the Marianas. A few months later, in August, the Enola Gay would take off from the same island to drop the world’s first Atomic bomb used in combat on Hiroshima. However, that day in May, the bomber carrying Sam Polonsky was loaded with conventional ordinance and headed for the Japanese city of Yokohama. Fifty miles southwest of their target, just north of the ancient fishing village of Yaizu, witnesses reported that an enemy twin-engine Ki-45 Toryu, a “Nick” to the Americans, dropped out of the overcast at 19000 feet and intentionally rammed the Polonsky plane, tearing off the bomber’s right wing. The B-29 fell four miles and exploded on impact. None of the 11 crew members survived and Jennie Polonsky got a telegram saying her son died in Japan. He was 32. 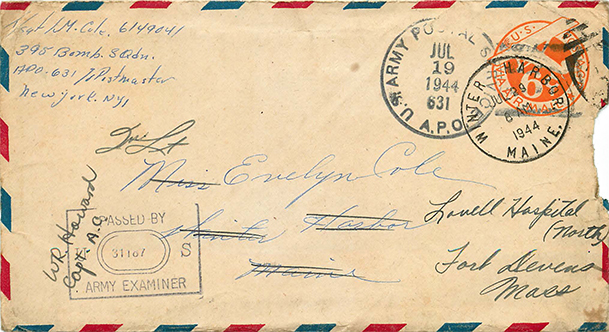 July 15, 1944 – Lawrence’s last letter from India to his sister, Evelyn. Sent 11 days before the crash. The box of old letters I found in my parents’ attic contained the last two letters Evelyn wrote to Lawrence which were both returned unopened. It also had the last letter he wrote to her. The letters are chatty and jokey and full of Winter Harbor gossip. 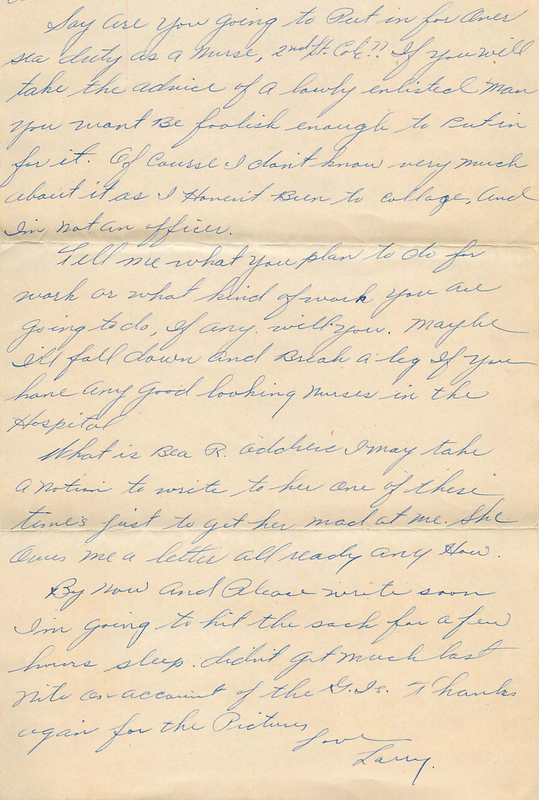 In one of Evelyn’s letters to Lawrence, she mentions a girl they both knew who she had seen the last time she was home. “Also ran into B___ at an all night dance in West Bay. She also has taken quite a bit to the bottle & sailors. Sailors are O.K. but the combination isn’t good“. It appears my mother had nothing against dating sailors… just as long as you don’t drink with them. That’s a lot of wisdom for a 22-year-old. In his last letter to Evelyn, Lawrence put his tongue firmly in his cheek and offered his sister some brotherly advice in the event she was considering volunteering for duty overseas. I am sure Uncle Lawrence would not have been overly surprised to find out his sister completely ignored his advice. Lawrence and Evelyn were close. She never talked to her children about him without smiling. 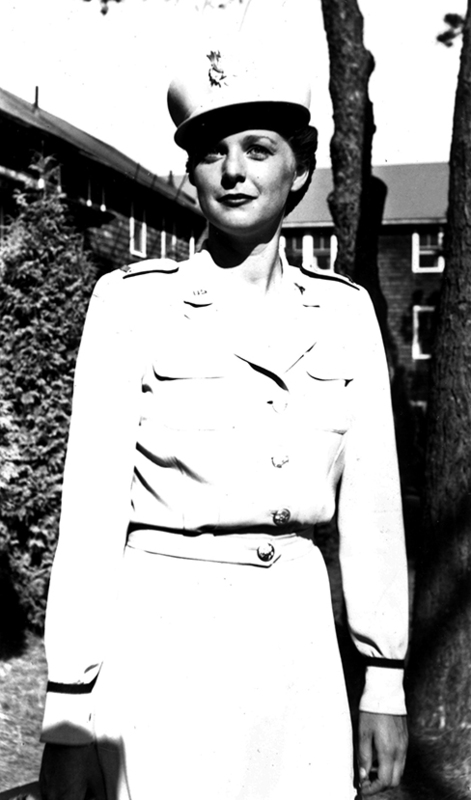 By mid-July of 1944, Evelyn was at Fort Devens, Massachusetts waiting for basic training to begin. Over the next four months she would learn marching, Army discipline and procedures, how an Army Field Hospital operated, the intricacies of mess kits and field latrines, and how to use a gas mask. In December of 1944, the Army’s 221st General Hospital moved to New York City and on the 10th of that month, boarded the RMS Queen Mary bound for Scotland and the European Theater of Operations. For World War II, the luxury liner had been converted to a troop ship. Before the war, her capacity was 2149 passengers. For Evelyn’s crossing, the ship carried 11,996 troops. Evelyn described the accommodations aboard the Queen Mary as “cozy“. Years later, I asked her what memories she had of boarding the great ship that Sunday in New York. Grinning conspiratorially, she confided what she remembered most was, she had never seen that many fit and attractive young men in one place in her life. I always loved that grin. The crossing was uneventful and on Saturday, December 16th, the Queen Mary sailed up the Firth of Clyde and docked at Gourock, Scotland. Fifteen months earlier, Evelyn’s future husband, a young bomber pilot from Georgia, had disembarked at the very same spot on his way to England and the 96th Bomb Group. As my mother arrived in Scotland, my father had just completed his first year of captivity in a German POW camp. My parents were still two years away from meeting but, for the moment, they were in the same theater of war. After disembarking the Queen Mary, the 221st boarded a train and headed south. 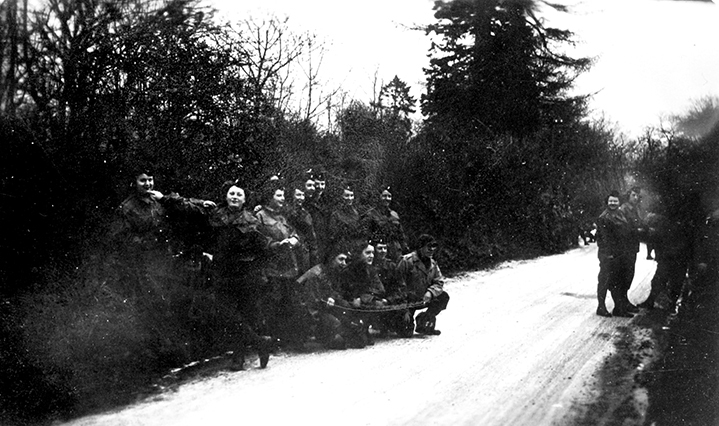 From their arrival in England in mid-December 1944 until they crossed the channel for France in late January 1945, the 221st General Hospital was billeted at Wykham Manor, an estate just outside Banbury. Located in Oxfordshire, 64 miles northwest of London, people have lived in the Banbury area for over 2000 years. The town name has existed since the mid 6th Century. A Roman Villa once stood on the site where Wykham Manor and its lovely grounds were built in the 1850s… The same lovely grounds where Evelyn’s unit was now parking its trucks and jeeps… The 221st had trucks and jeeps that needed parking. The front lawn of the Manor house probably seemed as good a place as any. Late December or early January 1944-45. The 221st General Hospital’s billet at Wykham Manor. Note the heavy equipment tire tracks in what was once the front lawn. 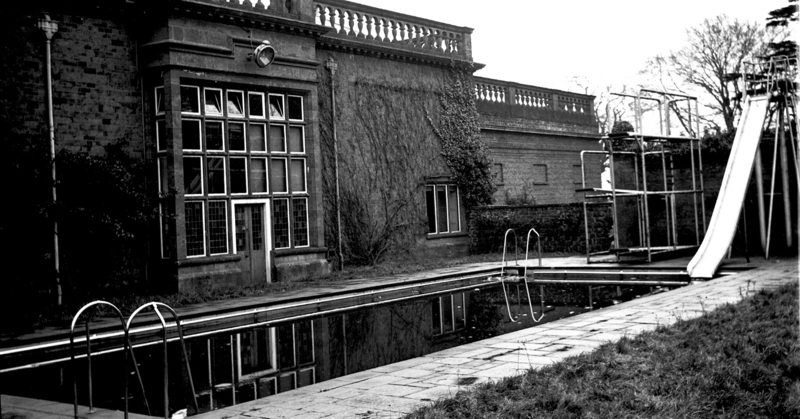 Late December 1944 or early January 1945 – The swimming pool at Wykham Manor. Evelyn had a story the pool at Wykham Manor. What she had heard was, the guy who owned the place before the war had married an American from California who liked to swim and wanted a pool. I like to imagine the English gentleman explaining to his new bride that, given the weather in England, it would be highly unusual for a Manor house to have an outdoor pool…. and then to witness that moment when he realizes he is going to have to build one. The swimming pool at Wykham ended up having three diving boards and a big slide. I really hope the story about the American girl is true. 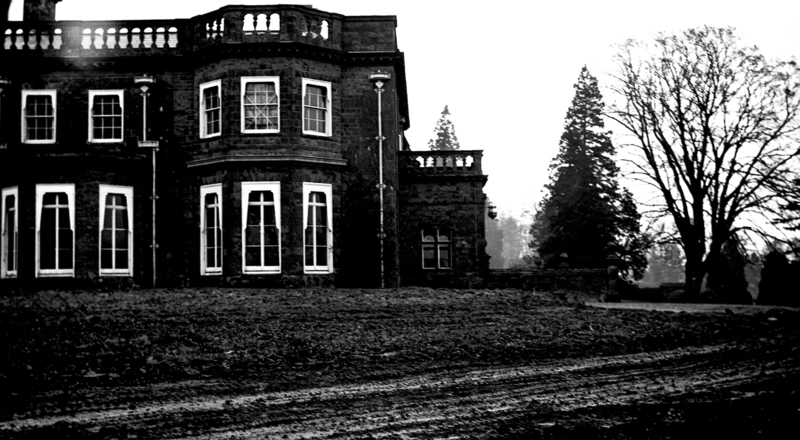 Shortly after the war, the Wykham estate became a girl’s boarding school. On a trip to London, I took a train up to Banbury and visited the Tudor Hall School. It is quite lovely and the Manor house and grounds probably looks much as they did when my mother was there… I mean, they had fixed the lawn, so, that was better. I was careful to park my car in the driveway. No sense in opening old wounds. One of Evelyn’s memories of her time in England involved a chance meeting on a railroad platform. According to her, after a Friday in Birmingham on leave, she and a fellow nurse were headed back to their outfit 37 miles away at Banbury. It was late in the evening and, as the two nurses stood on the platform waiting for their train, Evelyn noticed some American soldiers and a familiar face. One of the young men turned out to be a guy she had gone to school with at NYU. According to her, the whole incident was just a matter of two classmates running into one another in a far away country. 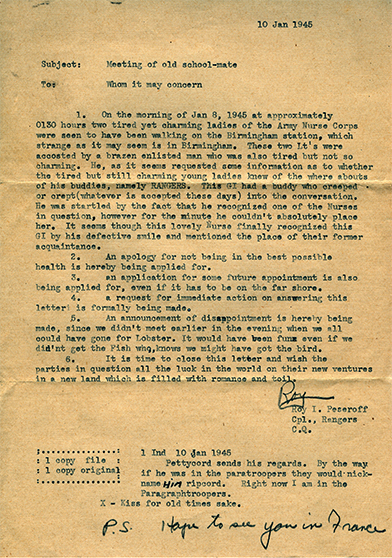 Apparently, it was not late Friday night but 1:30 Saturday morning and it was the letter writer, Corporal Peseroff who did the noticing and made the first move. Only after Peseroff began chatting up the nurses did his buddy, Pettycord, approach and the school reunion take place. When relating this story to her children, Mom said she recognized her NYU classmate because of an unusual facial feature, Pettycord had a cleft palate. This is what Peseroff is referring to when he mentions my mother, the “lovely nurse“, noticing his buddy’s “defective smile“. A research note: It was fairly easy to track down information on Peseroff on the internet and I thought Pettycord would also be a snap. Unusual names really help. However, Pettycord is very rare and nothing I found matched anything I knew about the guy my mother went to NYU with. I suspect Peseroff had never seen his buddy’s name written out and it was actually the more common, “Petticord” or, more likely the very common, “Peddicord”. Peseroff was just spelling the name the way it sounded to him. In any case, there were no WWII military records for Pettycord and too many for Petticord and Peddicord for me to come up with a first name. Born in Brooklyn, the 24-year-old Army Ranger was 6’1″ and a little under 200 pounds. Athletic, with a sense of humor and four years of college, Roy seems to be exactly the kind of guy whose flirty letter a 23-year-old girl would hold onto… for 70 years. After meeting Lt. Cole in the Birmingham station, Corporal Peseroff crossed the channel, got into the fight in Europe, and somewhere along the line, got wounded in action. Roy never saw Evelyn again but he made it home, lived a life, and passed away in Florida in 1998. Not a bad war story, all things considered. I have found no record of the exact date the 221st General Hospital left England but, by the 26th of January, 1945, they were on a train passing through Barentin, France. The ship that brought them across the English channel docked at the port of Le Harve. Le Harve is only 37 miles from Barentin, so I am fairly confident they had only been on the continent for a day or two, at the most. Evelyn vividly remembered arriving in Le Harve. It was the first time she would see the devastating effects of war. To get an idea of what her experience was like, go to Google images and search for “Le Harve” and “1945”. My mother never forgot what she saw that day. By the end of January, 1945, the 221st was in a combat zone. Their preparation was over. Now they were in it for real. Fabulous story. Looking forward to more on this. Terrific story, your family was obviously VERY involved. The R-3350 engines on the B-29 were prone to overheating and catching fire, a problem that was only marginally under control at the end of the war. The B-29 was the most expensive weapon system of the war, more than the V2 rocket or the Manhattan Project. It was a quantum leap in range, speed, ceiling and load; but it was deployed well before it was really ready. No doubt its development would have taken years longer if not for the war. Your family knows the human cost of that. I look forward to more of this! It is always fascinating to hear the real stories from this time. Another great post. The B-29 accident is tragic. Losing four engines that quickly must have been terrifying. Thanks so much for the Queen Mary link!! Thanks for another superb post. As ATCDave mentioned, the B-29 engines were famously unreliable – if not downright dangerous. After the war the USAAF re-engined ALL their remaining B-29s. That’s how bad the problem was. Sadly, your Uncle was caught in the exigencies of war. Fascinating read. Thank you for sharing this. Thanks Daniel. I really appreciate the feedback. There will be a new post to the Box of Old Letters project this week. Fascinating story. I love the details you have been able to add to the story. They help make it real. I look forward to more about A girl From Maine goes to War. Wonderful story. And I enjoy happy endings as I grow old. Great read. Will follow other posts as well.